The Saxony Orchestra comes with a different tuning. The harmonica is tuned in the key of C but it starts on hole 1 with the note G2. On hole 3 is the C note and from there it goes up like the Solo tuning in C.
This gives you some extra low notes which is very useful for players who play in an orchestra. The Origin of Sound - the SAXONY CHROMATIC - the first serial-produced chromatic harmonica with stainless steel reeds! 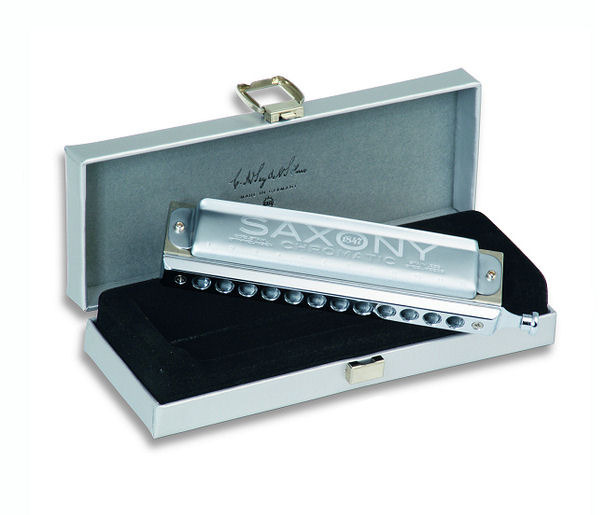 The SAXONY CHROMATIC is a professional chromatic harmonica with unique playing features. The instrument benefits from the stainless steel reeds well known from the 1847 Blues harmonicas and the timeless precision manufacturing of the Renaissance chromatic harmonica. All components were rethought and improved – the result is the SAXONY CHROMATIC– a master’s instrument that fits professional demands. This harmonica opens a new dimension of SEYDEL's long tradition of making quality harmonicas. Precision, made in Klingenthal / SAXONY / Germany.